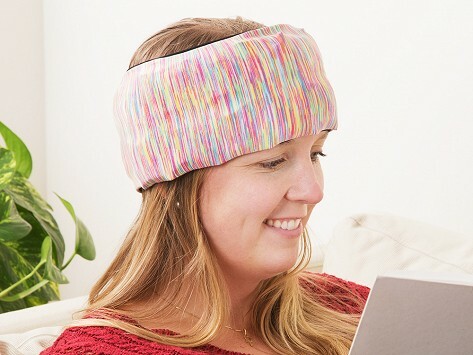 Cool comfort from a wearable ice pack that delivers icy relief from migraines, headaches, and even hot flashes and fevers without getting in the way of your day. The comfy, stretchy wrap has a reusable ice pack inside. Individual cubes filled with purified water (longer-lasting than gel ice) help you target the cold right where you want it. Made in the USA. Dimensions: 24" x 4" x 1"
I liked it so well I bought another one for my best friend. I've been using ice bags for years when I get migraines. This is so much better. I keep the ice packs in the freezer so they're all ready for me when I need them. I especially love how it wraps around the back of my head. I didn't realize what a big difference this would make in helping cool down my head; I only ever had the ice bag on the front. I don’t like it. The ice gets too hard to ware over the eyes. Maybe if I just put it in the frig it would do for the eyes, but with it solid it’s only good for the head or another body part.